Download pdf Are Americans Ready for the Artificial Intelligence Revolution? Discover what Americans think about -- and what they can do to confront -- the artificial intelligence revolution. 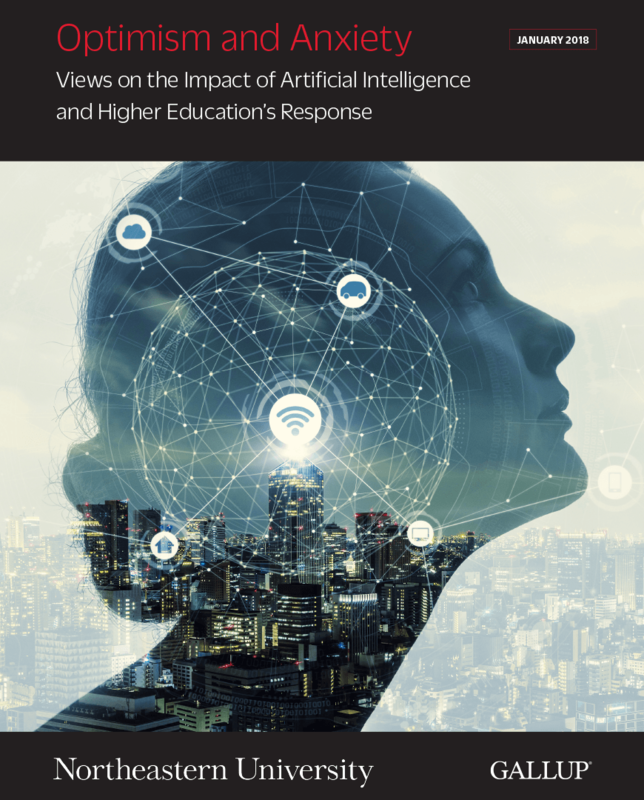 Get the report Optimism and Anxiety: Views on the Impact of Artificial Intelligence and Higher Education's Response, based on a survey conducted in 2017 by Gallup and Northeastern University. The single biggest threat to future job growth in the United States is the surge of artificial intelligence. As many as 47% of jobs in the U.S. are at risk of being replaced within the next 20 years. What Americans think about this revolution: Will it make a positive impact on their lives, or will they lose their jobs? Their preferences for confronting it: What education options do they prefer, and should employers offer and pay for retraining? How higher education institutions and others can rise to the challenge and prepare U.S. workers to succeed in the digital economy: Should the government incentivize solutions, and what is the best way for higher education and businesses to respond? Visit northeastern.edu/gallup to learn more about this report. Download the report about Americans' views on artificial intelligence. Please fill out the form below to access the report. Someone from Gallup or Northeastern University will receive this information and may contact you via email or phone about your interest in this topic and other Gallup products and services.